We are a multigenerational family business that works to save, restore and promote the endangered hardwood forests of the Willamette Valley. To this end, we carefully manage our own Zena Forest with a goal of creating a robust and sustainable forest ecosystem supported by the craft production of local Oregon hardwood flooring, lumber and millwork. In addition, we’re committed to protecting Oregon’s forestland, and help other landowners find ways to keep their forests intact through good management practices. Zena Forest Products’ model is unique: we’re the only company in Oregon that’s integrated all aspects of the timber process – using sustainable forest management and harvesting practices to create beautiful/heirloom/artisan products made from rare Oregon White Oak, Western Maple and Oregon Ash. We provide a beautiful, local, one-of-a-kind alternative to imported hardwoods for local building projects. In the heart of the Willamette Valley, the Zena Forest is a 1300 acre parcel of FSC® certified forest land nestled in the Eola Hills a few miles northwest of Salem. The forest comprises the largest contiguous block forest within the Willamette Valley. It includes large areas of the endangered Oak Savannah and Oak Woodland ecosystems, as well as headwaters of Rickreall, Yamhill, and Spring Valley watersheds, and is home to a number of threatened and endangered plant and animal species. The forest is protected by a conservation easement stipulating that the forest will remain a working forest in perpetuity. No development is allowed, and strict harvest levels, as well as habitat preservation and enhancement, are mandated by the easement. The forest has been managed by the Deumling family since 1987. No Chemicals – We remove invasive species by hand, using machetes and plenty of sweat. The forest is a family operation. Sarah Deumling manages the forest, and oversees all restoration, logging and planting, as well as leading tours and hosting school and university groups. 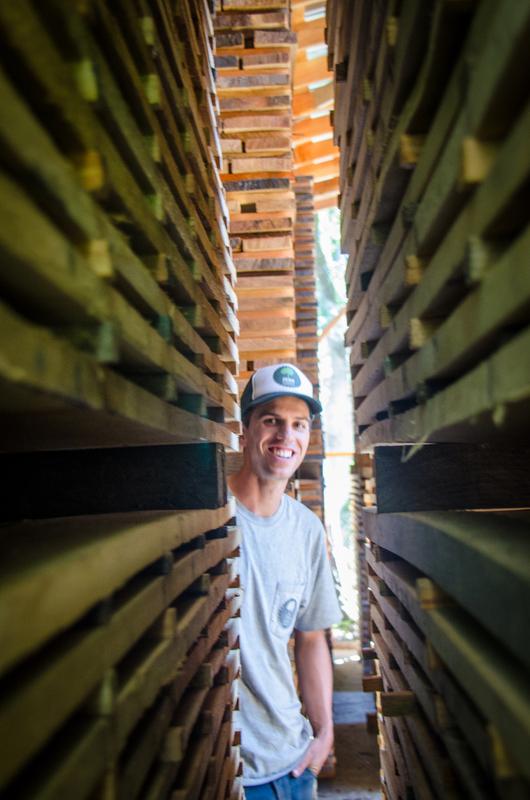 Sarah’s son Ben runs the sawmill and millwork operation located in the forest. Ben grew up working in the Zena Forest and shares his mother’s passion for the forest and all it has to offer. Our FSC character Oregon White Oak gets a nice showcase in Dwell’s story about this ultra energy efficient Portland home. Zena Floors at Salem Summit Co.
We aren't mentioned by name, but our flooring is front and center! Read the Statesman Journal's write up of the new Salem Summit space, which features our Oregon White Oak flooring. This cover story from the Eugene Weekly looks at the value of timber lands beyond the price of the saw logs. Zena is featured as an example of a place you can buy local, sustainable lumber. The Joinery explains why they source Oregon White Oak from Zena Forest Products. Zena Forest Products made the cover of Willamette Valley Life! OPB profiles Ben and Sarah Deumling. Artist Kristin Kuhns used Zena trees to make an incredible art installation at Salem Public Library. See also this write up in the Statesman Journal.